The importance of communication in preparedness cannot be overstated. If it all comes crashing down and normal methods of communication are thrown out the window Ham radio is one solution. Ham radio has been as mystifying to me over the past several years as trying to read hieroglyphics off an Egyptian pyramid wall. Talking to a lot people, reading a few articles, and watching a ton of video’s has helped a lot. It is all starting to come together. Search the ‘net and you can find tons of information on Ham radio. I am no expert and still have a lot to learn. Baofeng is a name that is extremely popular with Ham operators as they provide inexpensive, entry-level radio’s starting at around $30. Yes – a license is required to TRANSMIT on most any frequency but listening is not a problem. 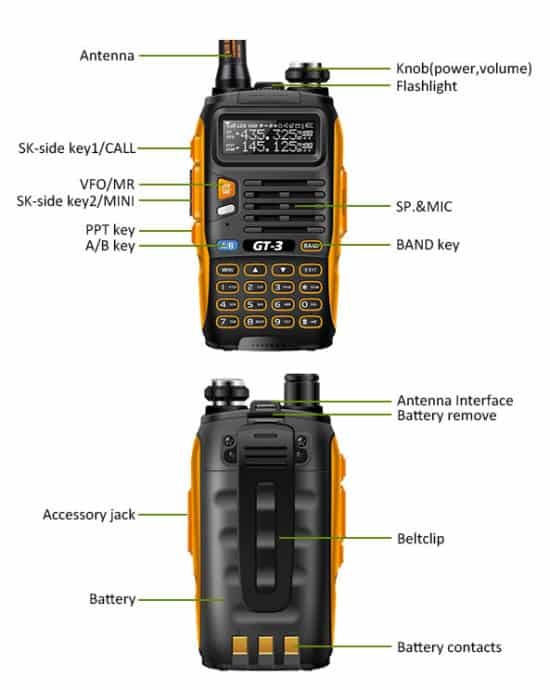 Out of the Box: My out of the box impression of the Baofeng GT-3 Mark II Handheld Ham radio was very positive. Build quality appears to be first rate. Everything fits, turns, and operates as it should. The included accessories are quite impressive at this price point – charging stand, belt clip, wrist strap, high performance antenna, combo mic/earpiece, and a car charger. Programming: If you are unfamiliar with programming frequencies into a handheld it can be very intimidating. YouTube and the website miklor.com can be a huge help. Following manual programming steps can be tedious – but once learned is not that difficult. Most all of the programming I do is using a laptop along with special software and a programing cable. The software can be downloaded HERE. Again – Youtube has been a huge help and once I programmed a few Baofeng radios it was a breeze. By the way – I use the exact same cable and software on the GT-3 as I do my other Baofeng UV-5R’s. I have had no issue with compatibility which is a huge benefit. What am I programming in these radios? 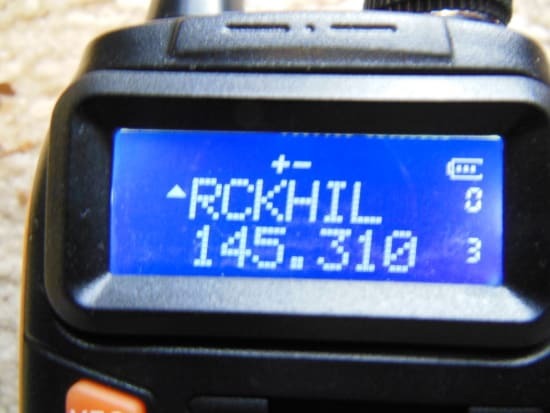 There are several local repeaters I have programed into the GT-3 as well as all FRS/GMRS, MURS, Marine, and a few other frequencies specific to my locale. A total of 128 channels can be stored. Antenna/Performance: The included SainSonic antenna that comes with the Baofeng GT-3 is a huge improvement over the Baofeng standard antenna. To put this in perspective I have a group member that lives approx 25 miles from our local repeater. 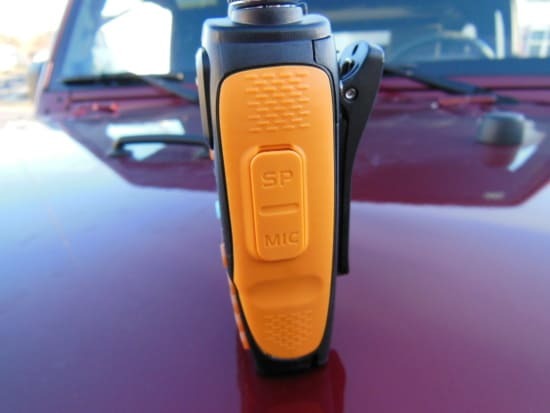 With the standard Baofeng antenna he needed to find the tallest spot on his land and actually hold the radio up a couple feet to obtain clear transmission with the repeater. During comm checks the GT-3 with the antenna SainSonic antenna he was able to reach the repeater 25 miles away without a problem without holding his radio up in the air. 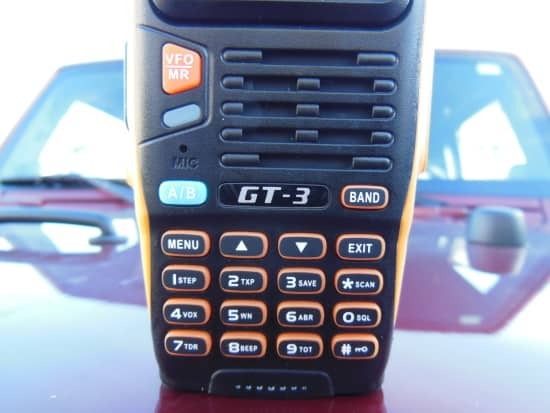 The GT-3 has upgraded internal electronics that are intended to allow it to communicate clearer and further. 25 miles. Not bad for a handheld with a “short antenna”. 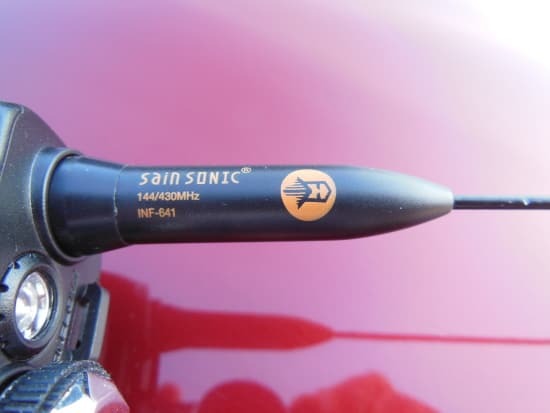 SainSonic makes some other antenna’s including THIS ONE I am wanting to try. 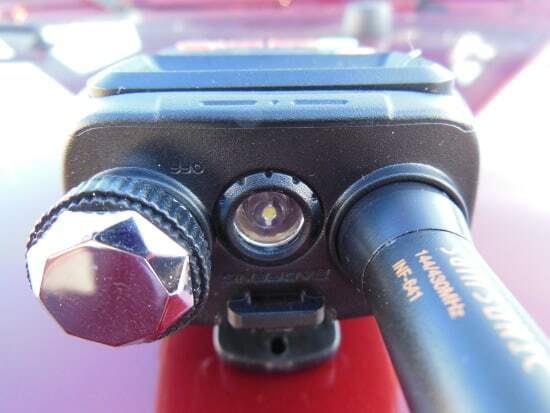 LED Flashlight: Certainly having nothing to do with communication but it is a feature of the radio is the inclusion of an LED flashlight at the top between the volume knob and the antenna. Redundancy is something relished by myself and other survivalists and having another option for illumination is certainly not a bad thing. The light on the Baofeng GT-3 is an upgrade over the UV-5R. It is plenty bright enough to walk the dog or make your way through the house in a power outage. Antenna Mount: The GT-3 has a standard SMA female connector. This provides a huge assortment of antenna options including one of my personal favorites the Nagoya UT-106 UHF/VHF Mobile Antenna. Many antenna’s are available and are relatively inexpensive. Belt Clip: I played with the notion of leaving the belt clip off but to be honest it comes in handy. I never carry any of my radios on a belt however I do clip it to pack straps, my pocket, as well as numerous other spots of convenience. 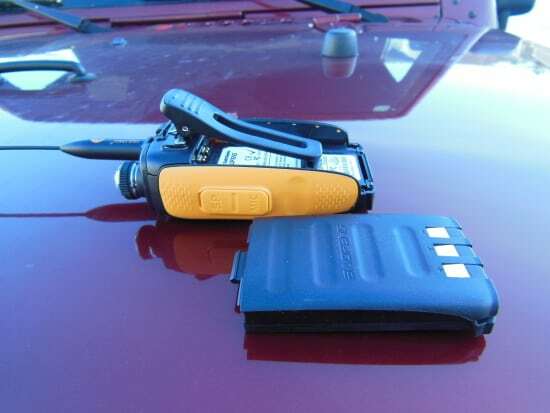 It mounts with two small Phillips-head screws securely to the back of the radio and the spring loaded clip is very strong. 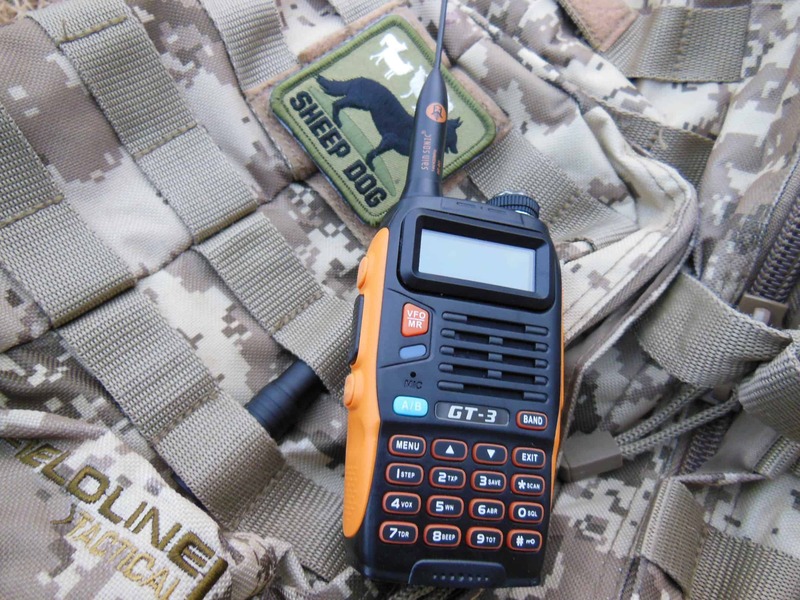 Battery: The battery life of the Baofeng GT-3 simply awesome. I have left the radio on for a couple days by mistake and it still had power to receive and transmit. The battery is a 7.4V 1800mAh lithium-ion which provides this performance. Extra batteries are inexpensive at around $11.00. 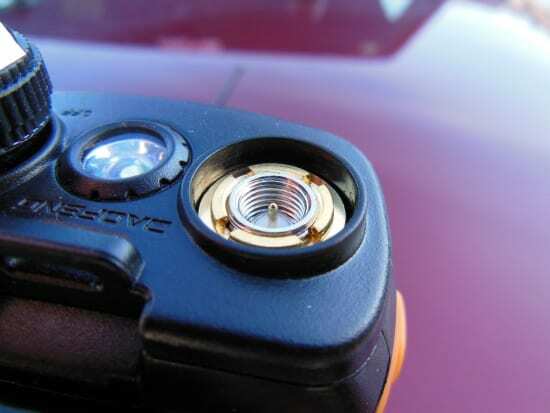 The battery is removed from GT-3 by pressing down on the button just above the clip and then pushing the battery downward. Placing the battery back in the radio is a breeze. With the clip installed it needs to be moved out of the way while the battery is slid into place. The battery’s are not heavy or large. Carrying an extra one of two would be no problem. Call Button – Pressing the Call Button quickly turns on the FM radio. Yes – it has a built-in FM radio. Guess I didn’t mention that. Again – redundancy is in play here. It simply works. Pressing the Call Button and holding it down sends out an annoying ALARM. It’s there but I never use it. MONI Button: This is the Monitor button. Pressing the MONI button quickly turns on the flashlight. Pressing it again turns on a strobe function to the flashlight. Pressing it again shuts it off. 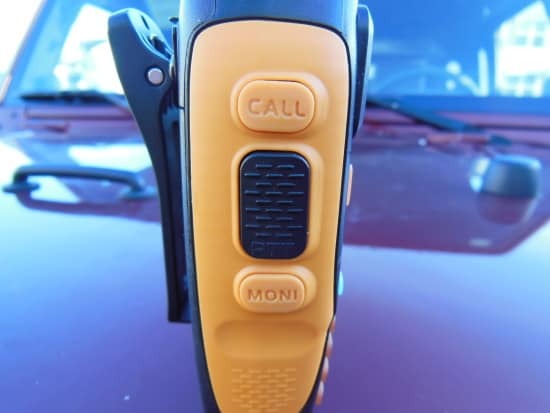 Pressing and holding the MONI button down will release the squelch on whatever frequency your “monitoring”. This feature I never use. Push to Talk: The black Push to Talk button is located on the left side and is obviously what you push to transmit. Ports: On the right-side of the GT-3 are the speaker and microphone ports. Standard earphones can be plugged into the speaker port. The included earphone/microphone headset also plug into these ports. The protective cover stays attached so as not to be lost. I removed it to take the picture above. 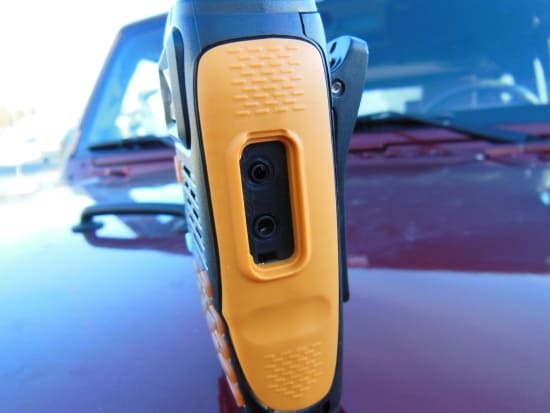 Speaker: One of the improvements the Baofeng GT-3 has over the standard UV-5R is the speaker. The sound is clearer and louder. It just flat out sounds better than the UV-5R. Keypad: The keypad just has a better feel to it than on the UV-5R. Not a big deal really. It also lights up differently than the UV-5R. The keys light up as well as a small area around the keys. On the UV-5R only the keys light up. Not a big deal – but I like the GT-3 better. Feel: The GT-3 feels good in the hand. Without the belt clip on it is a little slick. SOme friction tape would solve that. Since I always leave the clip on this is a non-issue. 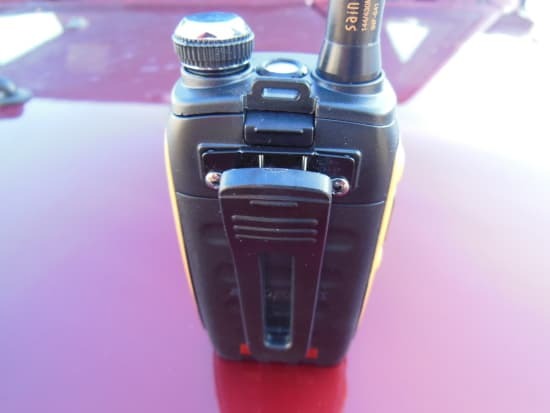 The shape of the radio being wider at the top and narrow on the bottom conforms to my hand better than the Baofeng UV-5R. The UV-5R feels like I’m holding a small piece of 2×4. The GT-3 is so much better. Display: The display is an area of controversy to many users of the radio. It looks phenomenal when you first turn it on as well as receiving and transmitting. When the radio sits idle the “backlit” display goes dark. As can be seen in the picture above – when the display goes dark the information can be seen, but it not easy depending on the light. If I could change one thing with the GT-3 it would be to have an option to leave the backlit display on constantly or just change it to the UV-5R display. 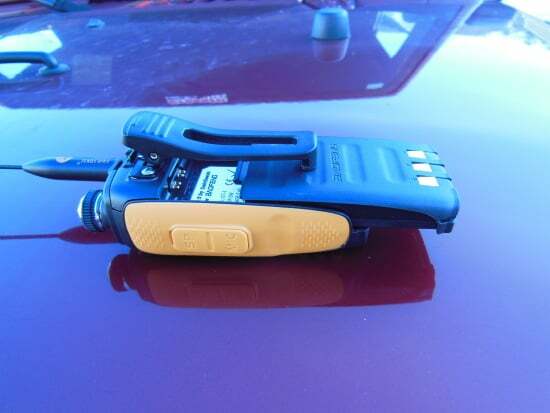 FINAL THOUGHTS: Costing around $45 the Baofeng GT-3 Mark II Handheld Ham radio is a bargain. The radio has many more features to it not mentioned including its dual-band capability and dual output (4 watts/1 watt). For those looking to get into Ham radio and do not want to spend a fortune this is the way to go. Back up communications should be an integral part of any preppers plans. 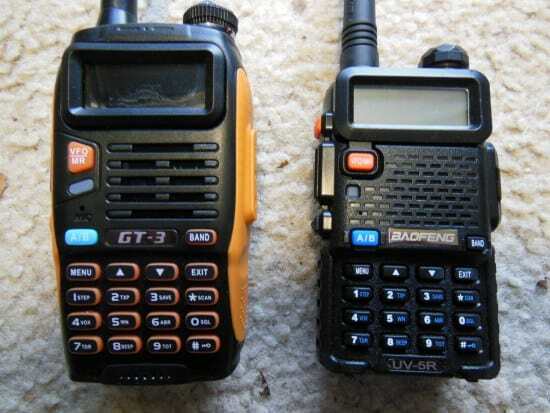 I highly recommend getting a few Baofeng GT-3 radio’s and learn how to use them. Don’t forget – to transmit legally a license must be obtained. I am very happy with my GT-3, I have noticed a difference in performance when compared to the UV-5R with a replacement antenna. Even listening one night on the repeater, there are many fans of Baofeng out there in the HAM community. I guess my question would be is how effective are HAM radios when you lose the repeaters. I would be interested in if two hand held radios could talk clear at the 25 mile mark and if not what is the range without a repeater? This is important because the repeaters could be lost during an event. Well, 3rdMan, most repeaters have a very high antenna, and very good electronics, radio wise. Now VHF, UHF radio frequencies are very line of sight. This means if you can see what you are transmitting to, it will work well. Probably not the exact answer you wanted, but the fact is that curve of the earth, hills, trees, even buildings will get in the way of your VHF/UHF signals. If you go to Mountain country with a friend, you climb uo one mountain and your friend climbs another mountain, to the points you can see each other from 200 miles away you will be able to communicate. I once talked to an aircraft pilot from my handheld radio, when he told me where he was, we were over 300 miles apart. Back to my above statement it is line of sight. Do not let that disturb you, you can talk to people close to you and they can talk to people close to them but farther away from you ad infinitum. The HAM community calls this Amateur Radio Relaying. Their main group is known as Amatuer Radio Relay League (ARRL) Come on, join us lets communicate! I have some of these. Lot of performance for a cheap price. Ad says everything is included but you will need to add 12vdc adapter and/or charger as well as programming cable. 3rdMan, as with all VHF/UHF radios, elevation is king. These are “line of sight” frequencies. Sure there is some “extra” in there, “over the hill” a bit, but it all depends on the frequencies you are using (144, 440, 900, 1250Mhz) as to how well it works with obstacles (trees, buildings etc) and distance. With out a repeater, these are just glorified FRS/GMRS radios (1-5 miles really). If you want decent comms, you need a good tower at your QTH (house), and mobile rigs in the car(s). A 50-60ft. tower, good antenna, low loss coax and a good install in the car, you can get 10, 15 even 20 or more miles depending on the terrain. My friend who just passed his technician test bought an 8 watt Baofeng and really likes it. Techs can only operate on FM, SSB and voice on 6m and high frequency bands. The general exam is not that much harder than the tech test and open up an enormous amount of frequencies to them. I avoid the 2meter and higher frewq bands, I communicate with an IC-7200 and a very low antenna (fan diapole at 15 feet). On transmit it is NVIS and I have spoken to Texas, New Mexico South Dakota Wyoming, Seattle, WA, and southern California. All on 40 meter. I have on numerous occasions listened into ragchews from Minnesota, Indiana, Georgia, North Carolin, Florida and Texas. I have heard a lot of Espanol talkers and assuse Mexico or points south, but since i do not abla I do not know for sure. The added benefits of General (I am an Extra, got my ticket after taking tech, general and extra in 1 sitting), are that you can use the lower bands with beam type antenna and go worldwide on some freq’s, or like me with a home made antenna in the back yard I paid $50 in parts and maybe 10 hours of labor and talk and hear 3000 miles.I am currently in the greater SLC, UT area. The biggest take away is if you do not practice the skills for HF, which are very different from VHF/UHF then you are signifcantly limiting your abilities POST-event. 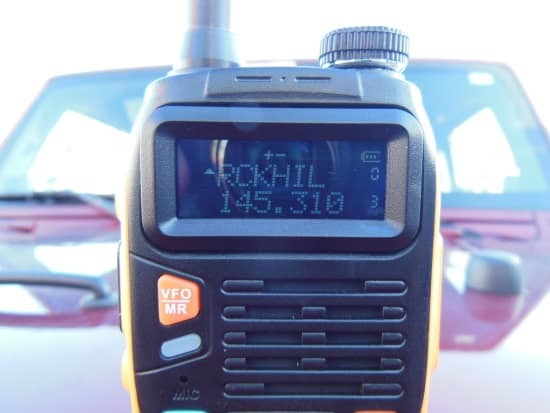 I know my radio was expensive, and not everyone can pass the extra exam, but general is fairly easy and used HF equipment is out there for cheap. There is a surprising amount of traffic on UHF and VHF SSB. That’s running with the “big boys”. Most of those guys have antenna “arrays” of 2, 4 or even 6 “beam” antennas stacked on a 100′ tower. Most run at least 500 and some run 1500 watts. The air is rarified up there. I tried once or twice with my FT-100d and a 17′ vertical and I was able to cover 350+ miles easy. No amp. It’s also VERY quiet, virtually NO background noise. Tech class is any mode, 50 MHz (6m) and up. There are standards on most bands about what modes can be used in what sub-bands to prevent mutual interference. 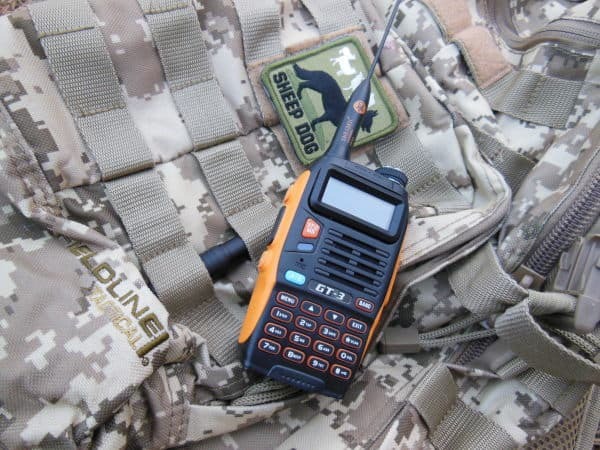 Hand-held radios are low-power and range depends on terrain and propagation. 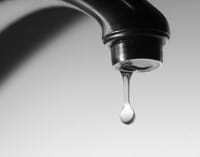 Remember propagation? It was on the test. Not everyone needs a repeater, nor is it necessary. Simplex with a quarter-wave antenna or a dipole can go from five miles to thirty miles, depending on how high you are up. Remember, it’s simplex from your radio to the repeater, so if you have line of sight for 1 – 20,000 miles, you can hit a repeater 99 miles away or an airplane five miles up. With a little directionality from a Yagi, a satellite 20,000 miles away. 500W or 1500W is hardly necessary unless you’re going to bounce signals off of the moon. (No, that’s not a joke). It will be CW unless you have a large set of stacked beams. 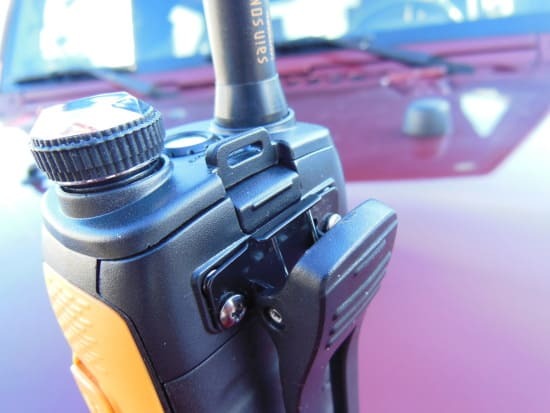 As far as the comparison to FRS radios, any radio with a severely compromised antenna (a “rubber ducky”) is going to suffer setbacks. Attach it to a proper dipole (or folded dipole), and it will work better. Get it above the ground, over people’s heads and it will work even better. NVIS requires following the MUF closely. 10m and 6m mostly work like VHF (line of sight) but occasionally don’t. Other HF bands talk around the world any given day. Occasionally, due to weather, there is ducting which improves communication to far off places. SSB is the best use of power for voice, but has noise. FM is relatively clear in comparison. AM is horribly inefficient. Data modes are slow/old at this point because the rules haven’t been updated with technology. CW is always an option. Spread-spectrum… is a whole ‘nother ball game. Also, this review is about the radio, not about any sort of communications through the radio or a true review of it’s capabilities. It’s comparing a Deuce and a Half to a Corvette on the basis of the color of the paint and the shape of the body panels. There’s a whole lot more technical to the radio than the shape and color. That’s why the ARRL reviews have all those extra numbers. And it’s ham (as in amateur) radio, not HAM. And that’s a male SMA connector, not a female connector, for obvious reasons. 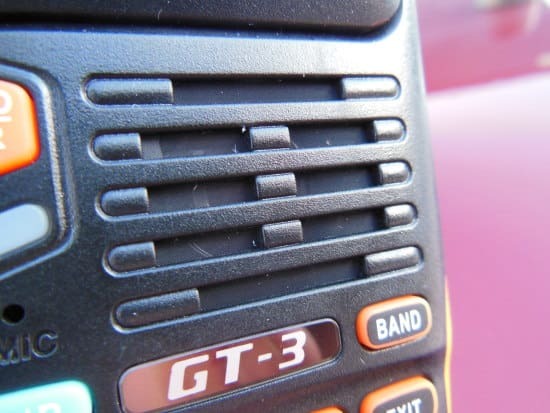 Does the GT-3 out put at 8 watts just on certain channels. I use marine band radios and thought from watt I read it would work.